Citation Information: J Clin Invest. 2007;117(4):868-870. https://doi.org/10.1172/JCI31669. Hypoglycemia commonly causes brain fuel deprivation, resulting in functional brain failure, which can be corrected by raising plasma glucose concentrations. Rarely, profound hypoglycemia causes brain death that is not the result of fuel deprivation per se. In this issue of the JCI, Suh and colleagues use cell culture and in vivo rodent studies of glucose deprivation and marked hypoglycemia and provide evidence that hypoglycemic brain neuronal death is in fact increased by neuronal NADPH oxidase activation during glucose reperfusion (see the related article beginning on page 910). This finding suggests that, at least in the setting of profound hypoglycemia, therapeutic hyperglycemia should be avoided. Sequence of responses to falling arterial plasma glucose concentrations. The solid horizontal line indicates the mean and the dashed horizontal lines the upper and lower limits of physiological postabsorptive plasma glucose concentrations in humans. 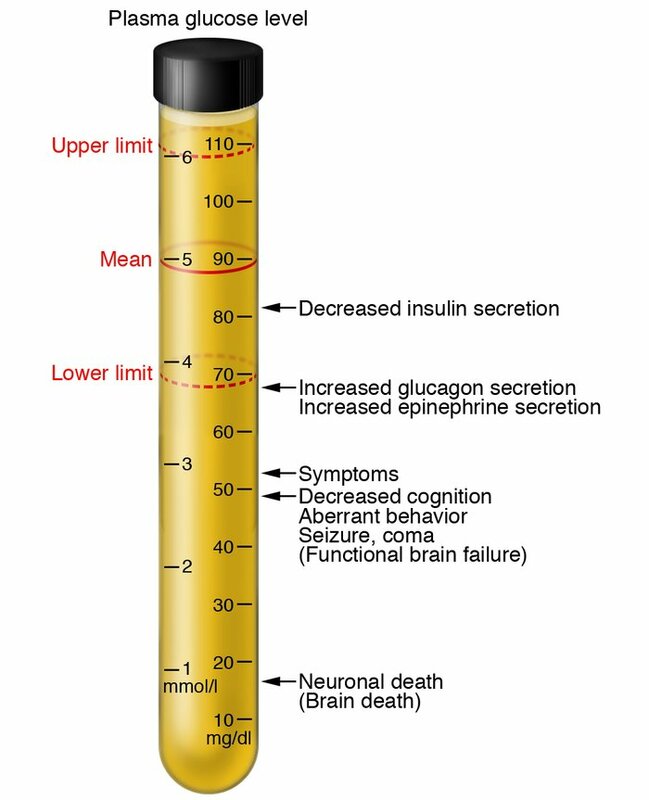 The glycemic thresholds for decrements in insulin secretion, increments in glucagon and epinephrine secretion, symptoms, and decrements in cognition have been defined in healthy humans (1) (see text). Those for seizure and coma and for neuronal death are extrapolated from clinical observations of humans (9) and studies in monkeys (12) as well as in other experimental animals (13–15). In this issue of the JCI, Suh and colleagues (13) report that glucose reperfusion increased brain neuronal death in their rodent model of profound hypoglycemia.